The Sea Change Podcast kicked off, Thursday, Oct. 18, on the American Shoreline Podcast Network, which also hosts shows such as The Next Shoreline and The Beach Shack Trailer. 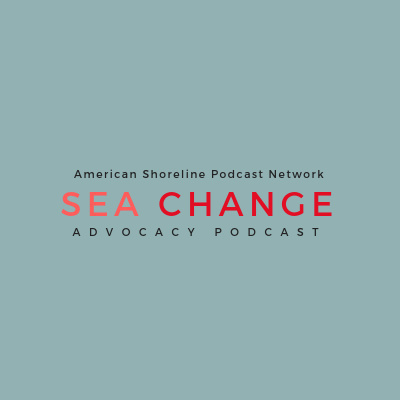 The Sea Change Podcast will offer insight into the powerful world of coastal non-governmental organizations and coastal advocacy. Jenna is a coastal advocate and a conservationist who has worked for the American Littoral Society (Society) as the Ocean Policy Manager and Healthy Oceans Coalition Coordinator for three years. Prior to her role with the Society previously worked for the Chesapeake Research Consortium at the Chesapeake Bay Program, where she was a member of the communications staff and focused on building the brand of the program and ensuring the health of the Chesapeake Bay. On the American shoreline, the voice of coastal advocates is a powerful, persistent, and pervasive force. Like the waves, this voice is sometimes predictable and steady and at other times it reaches a furious pitch. As our shorelines change and evolve -- an inexorable process -- coastal advocates open our eyes to considerations often overlooked and help shape public policy and the American shoreline for the better. On the first episode of the Sea Change Podcast, Jenna Valente welcomes Tim Dillingham, Executive Director since 2003 of the American Littoral Society. The Littoral Society was founded in 1961 by Dr. Lional A. Walford of the Sandy Hook Marine Lab with the intention it would bridge the gap between science and the public. It is not a quiet process. The clash of interests can be intense, passions can run high, but when we, as a society get it right, we can all look back with pride at the healthy coastal ecosystems we have managed to retain and sometimes enhance. And that benefits us all. Listen to the Sea Change Podcast and Jenna Valente, your guide to the world of coastal advocacy. There's a lot to talk about on the American shoreline! Subscribe to ASPN and get Jenna's show -- and all the other great shows on the network -- at Apple Pods, Google Pods or wherever you get your podcasts.